Sometimes hand stitching is seen as a lost art and it is true also but hand stitches are useful for everyone. In this article, you will learn how to sew the stitches and when and where to use them. You should know some stitching skill as it can be very helpful in case of emergencies when your cloth tore at some place and there is no tailor nearby. So, you should try these helpful stitches to make your projects easy. First thread your needle, knot your thread at the end and press the tip of your needle on the underside of your cloth or fabric. Now bring up the needle through to the top of the fabric until knot touches the back of your fabric. To create the stitches, maneuver the tip of your needle above and below the fabric or cloth. Before pulling the needle and thread out from the cloth or fabric, weave 2-3 stitches onto the needle as the running stitch is small. This running stitch is the easiest way to stitch any fabric as you can easily adjust the length of each stitch as per the requirement of your project. Like running stitch, thread the needle and knot the thread at the end and to hide the knot press the needle on the underside of your cloth and bring it up till the knot touches back of the cloth. The needle and thread should be on the left side of your cloth as you will be sewing from left to right. Place your needle about ½’’ to ¾’’ above your exit thread on the other piece of fabric and then move it to right about 1/8’’. Now, press the needle about 1/8’’ to the left to run it in left direction & hold the whole needle and thread up to the top of your fabric and after that pull the thread out. You need to press the needle about ½’’ to the right to make the signature of catch Stitch “X” and make your first catch stitch. To complete the stitch, bring it up to the cloth about 1/8’’ to the right. At last, pull the needle and thread and put the thread taut to make your catch stitch. You can continue these steps to create a length of catch stitches on any cloth or fabric. The X signature stitch on any fabric makes it stronger which is very important to stitch any type of cloths. You can use catch stitch to sew the curtains of your home as well. To do backstitching press the tip of the needle onto the top of fabric which will be about ½’’ down from your original exit point. As half of the stitches are sewn backward from the overall direction of the seam, it feels like backward stitches. Through the underside of your fabric, pull the needle, thread and thread taut. It is just a backward stitching, otherwise, it’s just like a normal stitch. Now press the tip of the needle onto the top of your fabric near to the original exit point. Again, pull the whole needle and thread to the underside of your fabric. Pull out the thread taut to make a back stitch. To complete your backstitch seam, you can continue with the same steps. Once done, you will see a pretty straight and solid line of stitches on your fabric. It is not just beautiful but it is strong as well and can be used where heavy-duty strength is required. First of all, you need to knot the end of your thread on the needle. Press the tip of the needle underside of your fabric or cloth up in one of the folds. To make the knot invisible, pull the needle and thread. From the original exit point, press the tip of your needle on the opposite hem. Now push the tip of the needle into the fabric so that it follows the hem inside the fold. After that, exit the needle tip form the hem fold about ½’’ – ¾’’ away from the insertion point. To close up the first rung of your ladder stitch, pull the whole needle and thread out from the folded hem. Thread the tip of the needle through the folded hem about ½’’ – ¾’’ away from the insertion point and then exit the needle. When you pull the whole needle and thread out, it will look like a ladder with stitch serving as a rung between two vertical hems. A ladder stitch stream will be completed when you continue with these steps. This stitch is the most common and effective stitch which can be used for closing up the pillows or cushions. You can make the stitches better by choosing the same color as your thread. Thread your needle and knot the thread at the end. The knot can be hidden by bringing the needle up to the top of the fabric from the underside. Above right of your original exit point, press the tip of the needle into the top of other cloth or fabric about ½’’ diagonally. Now, aim your needle from the underside of your cloth about ½’’ above left. Put the whole needle and thread through to the top of the original fabric and pull the thread taut also. A barbershop pole design seam will come out when you continue with these steps. Whip stitch is a very satisfying and easy stitch as it is fast and short which can be used for hemming things because these stitches are invisible. 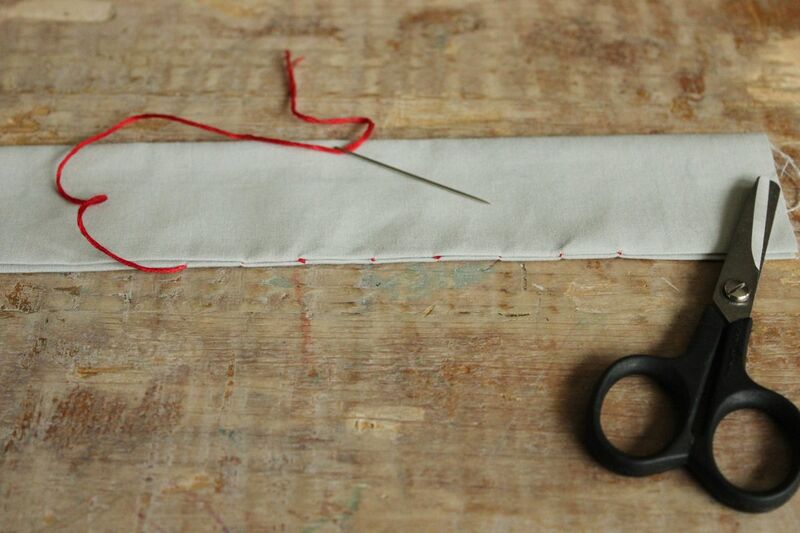 Once you knot the thread, press the tip of your needle into the underside of fabric about ½’’ away from the hem. Bring needle up to the top. It will run right to left so you will want to be on the right end of the seam. To hide the knot, pull the entire needle and thread through the top of the fabric. For the first stitch, you will need to loop the thread around the hemline and press the needle’s tip below of your fiber. Now put the needle and thread through the same hole. Pull the thread but keep a small loop of thread out. Take your needle and run it through the top which will go left to right. Thread your needle through this loop and pull the thread taut until it creates what looks like a square without a top. Once all done, you will see each stitch holding the previous one in position and in place. This stitch is more visible than others and can be used for the decorative purpose or for toys or any applique. So, these are some of the best and easy ways to sew by hand which can be used whenever you need to sew anything at home or when you is out of your home on vacations. You can make many designs using these stitches and can gift someone as well. Previous article How To Get Rid Of Fruit Flies Quickly & Easily? Next article How To Clean A Washing Machine?